BELMOPAN, Sun. Aug. 21, 2016–The road to the FIFA U-17 World Cup began for Belize at the Isidoro Beaton Stadium in Belmopan over the weekend, where the Belize District selection won the Atlantic Bank/Atlantic Insurance Under-17 Football Championships. The Football Federation of Belize (FFB), under Acting-President Marlon Kuylen, had assembled some 160 of the country’s best U-17 players, representing the 8 football district/regions of the country, for a 3-day showcase tournament, whose objective was to help the FFB select the National U-17 team to represent Belize at the upcoming FIFA World Cup 2018 qualifiers for the Central American region, to be held in Panama in November of this year. Participating district/regions included the six districts – Corozal, Orange Walk, Belize, Cayo, Stann Creek and Toledo – along with the capital, Belmopan, and the Mid-South area, which includes players from Independence and surrounding villages. While the luck of the draw, unequal travelling distances, and the number of games packed into 3 days of competition would not necessarily make it a legitimate “national championship,” the purpose was served to have all the teams countrywide showcase their talent, as the first step in putting together a National U-17 Selection. The 8 teams were divided into two groups, and a single round-robin was played within each group, the top two teams from each group then advancing to the semifinals. The round-robin had 8 games on Friday and 4 on Saturday, with the 2 semifinals taking place on Saturday evening. The 3rd place and championship games were both played on Sunday, all games being 30-30 (30 minute halves). In the opener on Friday morning, Belmopan dropped Orange Walk, 4-2, with goals from Freddy Romero, Christian Bush (2) and Justin Kalu; while Izhar Canas and Alexis Chan scored for Orange Walk. In game 2, Mid-South took a 2-nil first-half lead with goals from Tyrell Estrada and Veilman Lopez. Belize District equalized in second half with 2 goals from Kenny Linares, but Mid-South got a late goal from Zerick Cabral, to register the 3-2 win. Game 3 saw Stann Creek taking the 1-0 victory over Cayo on a free kick by Malachi Francisco. Game 4 was another 1-0 affair, as Toledo got a goal from Richard Hines to secure the victory over Corozal. The low scoring continued in game 5, where Adriel Pech scored the winning goal, as Orange Walk clipped Cayo, 1-nil. In game 6, Mid-South outgunned Corozal, 4-3, in a penalty shootout, after they had ended 3-3 in regulation. In regulation play, Mid-South got goals from Jeffton Apolonio, Zerick Cabral and Grevisai Cruz; while Corozal equalized through Denilson Novelo, Ray Jones and Imer Patt. In penalties, Jeffton Apolonio, Zerick Cabral, Gabriel Ramos, Jr. and Joseph Ramirez converted for Mid-South; while only Denilson Novelo, Imer Patt and Antonio Pineda made good for Corozal. In game 7 on Friday night, Stann Creek took the 1-nil lead on a goal by Davis Marshall, but Belmopan rebounded with goals from Christian Bush and Elton Gordon to grab the 2-1 victory. The game 8 nightcap on Friday night saw Belize District enjoying a 7-0 romp over Toledo with goals from Tyreek Muschamp (3), Jalen Babb (2), Kenny Linares and Ian Pou. Saturday morning began with game 9 of the round-robin, where Stann Creek dropped Orange Walk, 4-1, with goals from Demille Flores (2), Davis Marshall and Guy Sutherland; while Andir Chi got the sole tally for Orange Walk. Game 10 was another blow-out for Toledo, as Mid-South registered the 5-0 win with goals from Jeffton Apolonio (2), Veilman Lopez, Gabriel Ramos and Stephen Ramclam, to secure the top spot in their group. In game 11, Ainsleigh Perez converted a penalty some 9 minutes before the final whistle, to give Belmopan the 1-0 victory over winless Cayo. Game 12, the last game of the round-robin, ended 1-1 between Belize and Corozal, as Ray Jones struck first for Corozal in the second minute, but Tyreek Muschamp equalized 4 minutes before intermission. Standings in group 1 (win – loss – draw): Belmopan – 9 pts (3-0-0), Stann Creek – 7 pts (2-1-0), Orange Walk 3 pts (1-2-0), Cayo – 0 pts (0-3-0); and group 2: Mid-South – 9 pts (3-0-0), Belize – 4 pts (1-1-1), Toledo – 3 pts (1-2-0), Corozal – 1 pt (0-2-1). The first semifinal took place on Saturday evening, and saw Mid-South qualifying to the finals by eliminating Stann Creek, 1-0, with a goal from Gabriel Ramos, Jr. In the second semifinal, on Saturday night, Belize won a penalty shootout, 5-4, over Belmopan, after going 1-1 in regulation. Jalen Myers gave Belmopan the 1-nil lead at the 15th minute, but Tyreek Muschamp equalized things, 1-1, for Belize at the 39th minute. In penalties, Muschamp, Jalen Babb, Ian Pou, Akeem Sutherland and Shaquille Matute converted for Belize; while Jalen Myers, Korey Gomez, Elton Gordon and Jalan Budna converted for Belmopan. The 3rd place game was on Sunday morning, and saw the Stann Creek District selection defeating the Belmopan selection, 1-nil, on a penalty converted by captain Kendale Nunez, after Hakeem Smith had been taken down inside the eighteen. The championship game on Sunday afternoon proved to be an exciting high-scoring affair with some outstanding talent on display. Jeffton Apolonio outran the Belize defense to strike the Mid-South’s first goal at the 9th minute; but Ian Pou equalized for Belize when his center from near the left goal line sailed over goalkeeper Albert Palma and curved into the net near the far post to knot the score at 1-1. Five minutes later, Jeffton Apolonio blasted his second goal of the game from close range past Belize goalkeeper Alvin Magandi. It was Jeffton’s sixth goal of the tournament, to lead all scorers. Albert Palma rejected a shot from Belize midfielder Tyreek “Pippin” Muschamp, but it rolled to Kenny Linares’ feet, and he made no mistake, equalizing the score again, this time at 2-2. And that’s how first half ended. In second half action, Belize took the lead, 3-2, when Tyreek Muschamp’s center from the right goal line found the head of Jalen Babb near the far post. Then Jadon “Cheetes” McGregor caught up to a forward pass and eluded the defense to drill a fourth goal for Belize. After Belize goalie Alvin Magandi had deflected a shot from the left side by Jeffton Apolonio, the ball was picked up by Daren Apolonio, who unleashed a left foot blast beside the right goal post past a diving Magandi for Mid-South’s 3rd goal. 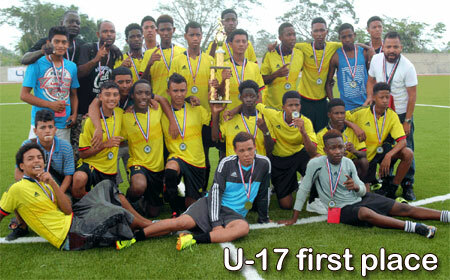 But the long whistle came soon after, and Belize District had won, 4-3, to take the U-17 championship over Mid-South. Following the championship game, FFB Acting-President Marlon Kuylen and Secretary General Michael Blease presented team trophies and individual medals to 1st place, Belize District, and 2nd place, Mid-South, and a team trophy to the third place team, Stann Creek. The tournament was certainly a great success, as a whole lot of talent was on display, and the FFB should have no difficulty in putting together a strong U-17 selection to represent the Jewel in the World Cup qualifiers in November. Some friendlies will, of course, be needed to fine-tune the squad.